This Proposed Mitigated Negative Declaration (MND), supported by the attached Initial Study (IS), evaluates the environmental effects of implementing the proposed Ironwood State Prison Heating, Ventilation, and Air Conditioning System Project, which would occur in a noncontiguous portion of the incorporated city limits of Blythe in Riverside County, California. 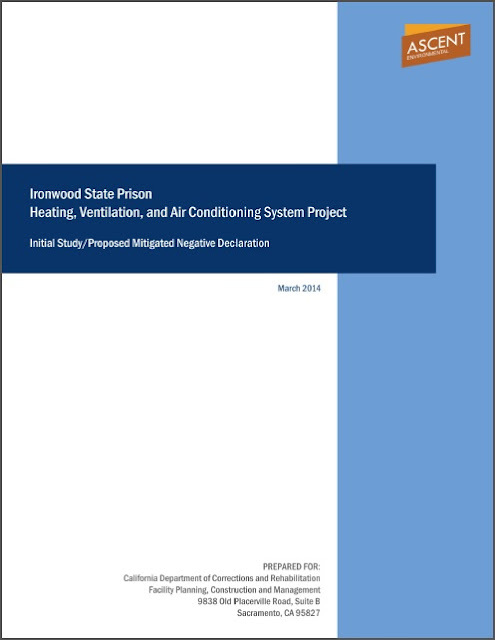 The applicant, California Department of Corrections and Rehabilitation (CDCR), is proposing renovations and additions to existing electrical and air conditioning facilities, all within a developed area of CDCR property. Specifically, the project includes construction of power line, an electrical substation, a thermal energy storage tank, and a central chilled water plant. All construction would be consistent in character, design, and height with other existing structures. No high-mast lighting would be installed as part of the project. The project does not include any new beds and would not increase inmate capacity.